This is a recipe I'm not sure that everyone will like. But the beauty of cooking for one is that you are the only one that needs to like it. This is also a recipe that can be customized to your taste, and what you happen to have on hand. 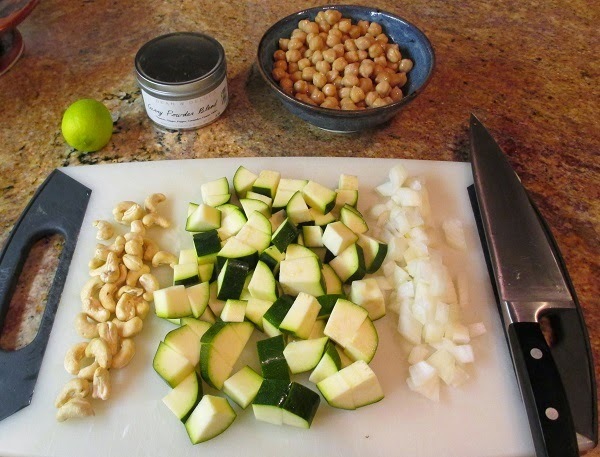 I am showing this with zucchini, but it works equally well with broccoli or kale. I'm guessing it would be great with eggplant (especially the long Japanese kind). I have used curry powder for seasoning, and I have used my southwest rub (equal parts chile powder, cumin, and coriander). I'm guessing it would work with that jar of spice mix you got for Christmas that smells great but you are sure how to use. Or skip the spice and use some fresh herbs and maybe some olives, like this version from Chocolate and Zucchini, which was my inspiration. But I have to tell you, my favorite part is the cashews... I keep a bag in the refrigerator special for this. And don't worry much about measuring. Put in about how much of each ingredient that you would like to eat. Remember the vegetables will shrink, so put in plenty. Taste as you go when you add spices and lemon juice. If you want to gild the lily, add some avocado or some fresh herbs on top. 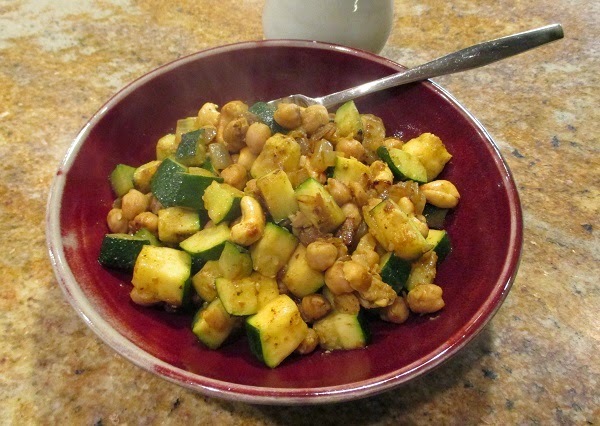 ½ can chickpeas (aka garbanzo beans). Rinse and drain. In a 10 or 11 inch pan, heat the olive oil over medium high heat. 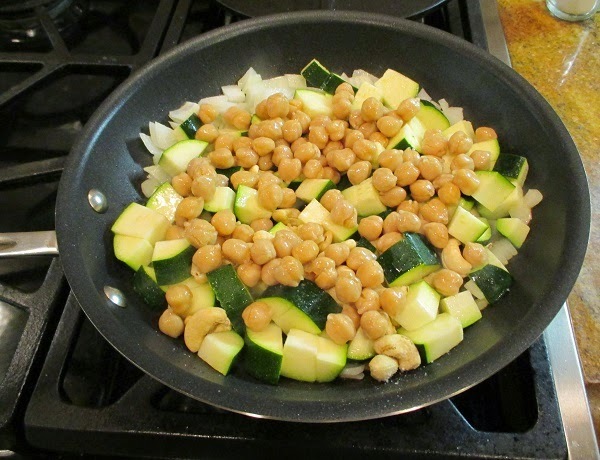 Add the onion, vegetables, chickpeas, and cashews. Add a bit of salt. Cook, stirring frequently. When the vegetables are starting to cook, add the spice and stir to mix. 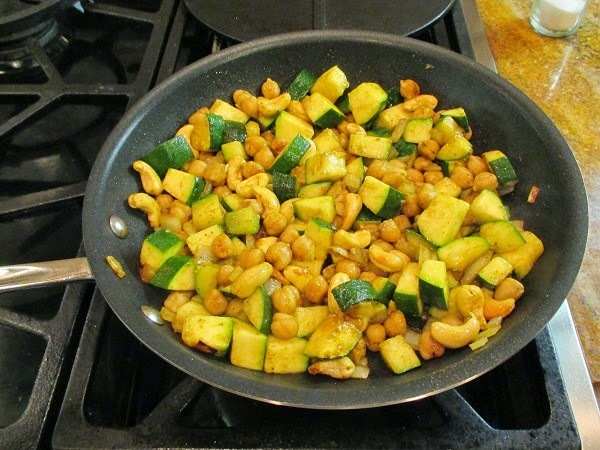 Taste a chickpea to see if there is enough spice and salt. Continue to cook until the vegetable is just done. Add a good squeeze of lemon or lime juice.